A Practitioner’s View of the Land. Movie lovers flock to theaters to watch their favorite movies and sports fans take to the stands throughout the year to see their favorite team play on clay, turf, and the hard top. Seasons change and so do movies and games. By the way, did you check out the latest Star Wars trailer that was released last week? Awesome teaser. We’ll introduce you to our own teaser at the end of this article. Not the movie kind, the techie kind. This fall, AuraBlocks happened to be part of one such yearly ritual in the technology world. The Oracle OpenWorld 2017 convention. Open World is the event that brings all things Oracle to town for one week. The talent, the technology, and the talks let us all know about the customer success stories of the past year, as well as helping us understand the technologies that will sketch the journeys of the future. A lot has changed around the world of technology since the first Star War series movie was released back in 1977, and a surprisingly large amount of things have changed since the time Episode VII: The Force Awakens was released in 2015. AI/ML, ChatBots, IoT, AR/VR, Blockchain/Distributed Ledger Technology(DLT), just-in-time anything, personalize anything (CX, Printing, Medicine etc), BigData, adaptive security meshes, self-tuning/healing/governing systems, open API’s, 5G, persistent memory, public cloud, and so much more. Blockchain, the backbone technology that powers the vibrant crypto eco-systems of Bitcoin and Ethereum, has come a long way and is positioned to be a transformative platform that can promote real-time business collaboration. Now is the time that Blockchain breaks away from being referred to as an emerging technology and is considered an enabling technology that can be put to use in enterprise architectures. The largest software vendors in the industry are taking notice and making huge investments in order to make Blockchain platforms a first-class tenant of enterprise technology stacks. Oracle’s enterprise Blockchain technology was officially released at OpenWorld 2017. The timing of the release couldn’t have been better. The core technology has gone through a series of vetting and validation cycles in the open-source community before being officially on-boarded to the Linux Foundation as a key project. Hyperledger Fabric community project under the foundation has grown into a solid v1.0 release. Oracle’s enterprise Blockchain technology cloud offering is built on the solid core from Hyperledger Fabric. 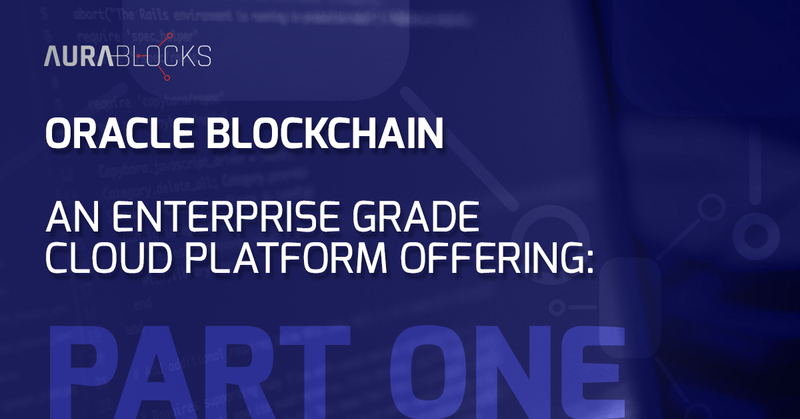 Enterprises, executives, and technology leaders can expect the same level of foundational strength in Oracle’s enterprise Blockchain that they would find in other mainstream technologies that are well-adopted by companies who had their origins in the Linux foundation. This stability isn’t even the best part of the offering. The best part is Oracle’s ingenuity and capability to build on this strong foundation and come up with an enterprise-class offering that satisfies the needs of the most demanding organizations out there. Today, most of these organizations are Oracle’s customers in other portfolio products and so it is a strategic and a natural evolution that Oracle deliver a platform offering like Blockchain that can transform the established business workflows amongst their existing customer base of today and new customer base of tomorrow. We will write in detail about these topics in our next series of articles that we will publish around product architecture and features. For now, know that these features (and many more) are nicely packaged into the Oracle Blockchain Cloud Services PasS offering that is scheduled for release at the end of this year. The release itself will be a Beta release. AuraBlocks has thoroughly enjoyed working with the product as part of the early Beta program. Our feedback comes from our experience working on the platform over the course of this year. We built and showcased two Blockchain solutions at Oracle OpenWorld 2017 for customers who have been operating in the Financial Services and Data Management Software industry for over 10 years. You can download a copy of the presentation that talks about our work for a Financial Services company, here. Let’s understand why Blockchain as an enabling platform is ripe for enterprise adoption and what some contributing factors are within the ecosystem that are facilitating this trend. Before going further, both Bitcoin and Ethereum deserve a mention for nurturing such strong ecosystems built on top of Blockchain technology. That being said, Oracle’s Blockchain offering is NOT Bitcoin or Ethereum. It’s surprising to see and hear many people that we talked to at OpenWorld join the Blockchain conversation with this preconception. We hope our future articles on Blockchain will decipher some of these established misconceptions and prejudices. Come back next time to learn more about Oracle’s Blockchain offering and how AuraBlocks has helped to push Blockchain forward and how we can help your enterprise or contact us for more information about how we can help your business integrate this new technology.